We shivered through a cold (10 F) night in our gooseneck trailer. Actually, we were warm enough wearing jackets and covered with blankets and down sleeping bags. 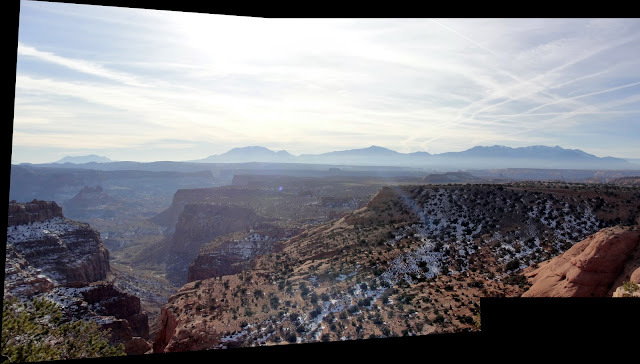 The first rays of sun rising over the San Rafael Swell began a slow warming. The drinking water left outside overnight was frozen solid. Fortunately, we had another water container in the trailer that was slushy, but pourable. The horses drank from a stretch of the San Rafael River that flowed near our camp. There was ice along the bank, and they weren't too sure about the getting close at first. As you can see, Mischief has been rolling in the dirt again. We decided to bag the rest of the trip and drive straight home. However, the desert warms quickly, and it was 40 degrees before we reached the highway. We couldn't pass up a ride on Limestone Bench. All that open territory was just too inviting. We came across this old camp, complete with stone benches and a stove. With that fired up, campers would have been comfy. Someone went to a lot of trouble to build a sundial in the middle of nowhere. Boy scouts, maybe? We had a nice ride across the bench, covering about 8 miles, just a taste of this vast territory. A glance at the weather report shows a good enough stretch for a 2 night, 3 day trip to the San Rafael Swell in central Utah. We head for the part of the Swell north of I-70. Click here for Wikipedia information on this geologic uplift formed 40-60 million years ago. On the first day, we ride through sandy Cane Wash.
About mid-way to the San Rafael River, we come to some free water and a lot of ice. The horses learn to tippy-toe across the ice, placing each hoof carefully so they won't slip. We aren't worried about breaking through because the water is only a couple of inches deep. The San Rafael has ice along the banks, but plenty of free-flowing water in the middle. A window in the rock overlooks the river. We look for petroglyphs but don't see any. On the return trip, Daisy finds a petrified log. She would love to fetch it, but it's a little heavy. It's probably 250,000 million years old, from the Shinarump formation. We discover the detritus left over from an old mining claim, including a storage room built into the hillside. We think it may have been where the miners stored dynamite. In case blasting caps might still be lying around, we do not enter. and a rusted International pickup. We complete the 16 mile ride at nearly dusk. Little do we know, the weather report lied. Instead of night time lows of near 30, temps dip to 10 F that night, a little cooler than we bargained for. and along the edges of Horseshoe Canyon. Steve and Daisy search for a safe way to descend from the sandstone rim. We find a few sketchy wild burro and/or crazy cowboy trails, but no path we consider safe. We don't find water, either, but the horses munch snow. Galloping over the flat areas has made them sweat, even though the air temperature is in the low 40's. An equine winter coat doesn't shed heat very well. When our trailer comes into sight, we are struck by the Henry Mountains looming behind it. Even parking along the road provides spectacular views! We have enough water in the trailer tank for both horses to enjoy a good drink before the drive home. Mischief wears a coating of reddish sand from the luxurious roll he took as soon as the saddle was removed. On the hour's drive back to the nearest paved road, this stark scene of mountains over sand dunes and snow catches our attention. On a long, hot ride with no water in sight, the horses cool off with bites of snow. Daisy luxuriates in snow drifts whenever she gets the chance. Back at camp, the horses enjoy a roll in the sand. Mischief looks like Pigpen from the Peanuts cartoons, with all the dust rolling off of him. Ah. After drying their thick fur and scratching their backs with a roll, Boss and Mischief catch the day's last rays of sun. After passing Sam's Mesa Spring, we continue across the desert dunes. Steve notices a skull marking a hilltop rock and climbs up to explore. The cow skull was on top of a section marker, apparently to make the section corner easier to find. Farther along, we spot a few fallen stakes and this mining claim, wrapped in foil. As you can see, it is still readable. The claim does not say what the claimee proposes mining for. Uranium, maybe? Uranium mining was common in the canyon country in the '50's. This claim was made in 2007. Our destination is the Dirty Devil River overlook. The view behind Steve looks down the Dirty Devil's canyon. The river was given its name by one of the Wesley Powell expeditions in 1869-1871. As they floated down the Colorado River, they came to the inlet of an unnamed river. "How is she, Jack?" someone shouted. "Oh, she's a dirty devil!" was the reply. Steve and Daisy approach the edge. The horses wisely hang back, probably wishing for some good grass to munch during their break. There is no way into the canyon and it doesn't look all that inviting from this vantage point anyway. Heading back toward camp, we have nice views of red sandstone canyon cliffs in the distance. On our second day in the San Rafael Desert, we head back to Sam's Mesa for further exploration. The views are classic western, worthy of a movie set. The Henry Mountains (highest point, 11,500 ft.) loom in the background. The yellow party balloons seem a little out of place. The wind must have carried them a long distance. The horses think they are scary at first, but our boys calm down when the balloons don't seem to bite. The strings are hung on a thorny bush. Good thing we don't hear a sudden loud pop. That could cause the horses to have permanent balloon phobia! Ten miles down a sandy road, we reach the slope leading to Sam's Mesa Spring. The hill is too snowy and slippery for the horses. Steve and Daisy walk to the bottom of the canyon where cottonwood trees mark the presence of water. If you look closely in the above photo, you can see Daisy sniffing around the trunk of the cottonwood tree. The spring has strong flow for this dry country, but the stream is frozen in the canyon's shadows. In summer, this must be a haven for birds and wildlife. On our trip to southern Utah, we explored Sam's Mesa. The deep gorge to the left is Happy Canyon. A branch of the Dirty Devil River flows through there. Sam's Mesa is the flat tabletop land above the canyon. Steve and Boss are standing at a fence gap. At this choke point,10 posts and 30 feet of barbed wire can close the only entry to Sam's Mesa. It's hard to appreciate in the photo, but on either side of the road, steep drop offs prevent taking an alternate route. Ahead of Steve, nature and time have carved deep valleys between the sandstone knolls. Here is some sandstone carving up close. Steve is studying his GPS to determine our next move. Daisy is checking out a possible bunny trail. We found snow in the shadows. Daisy enjoyed rolling in it. The horses didn't have a watering hole along the trail, so they ate a little snow to cool off after a gallop. The days were mild, in the 40's, and the nights were in the upper 20's. Not bad for January!